Fire-breathing dragon, Olympic torch, or both? 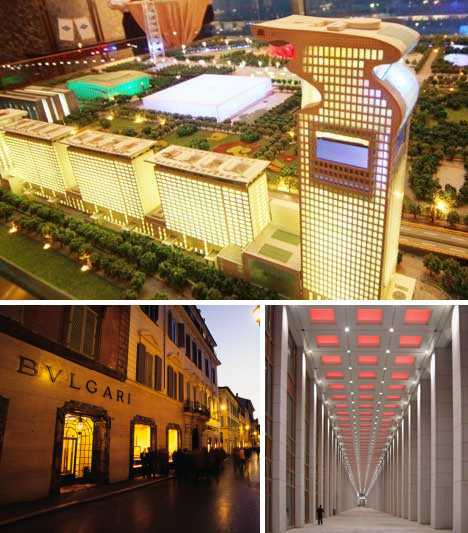 The Pangu Plaza complex is the latest architectural wonder reshaping Beijing China‘s increasingly Dubai-esque skyline, a product of architects eager to make their mark and city planners happily throwing cash their way. 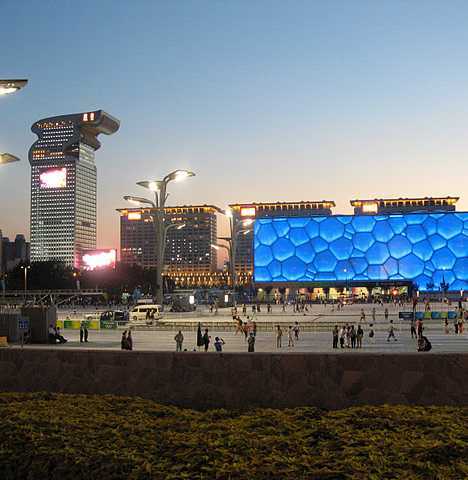 The 2008 Summer Olympic Games in Beijing were, among other things, China’s long-awaited opportunity to welcome the world and show off her astonishing progress. 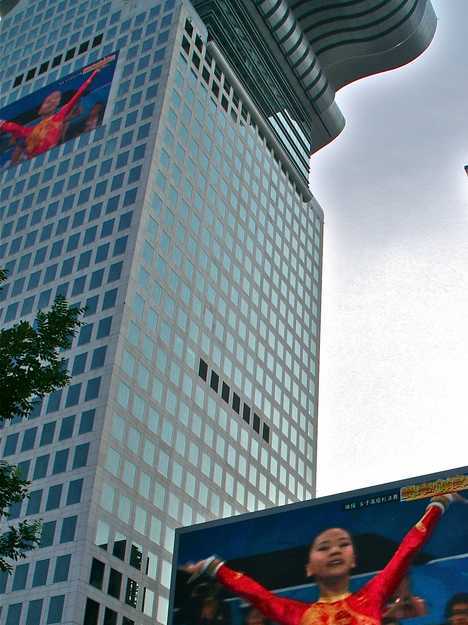 Beijing, in particular, revealed herself as much, much more than the Forbidden City and Tiananmen Square. Dozens of architectural showpieces which sprung up in conjunction with China’s booming economy over the past half-decade have succeeded in transforming the city’s skyline. One building, however, remains shrouded in mystery long after construction nets and scaffolding have come down: the Pangu Plaza. It’s certainly visible enough: look out from the National Stadium (casually known as the Bird’s Nest) in the direction of the National Aquatics Center, or the Water Cube, and you’ll spy an odd grouping of buildings festooned with hundreds of small windows, the tallest of which sporting a massive LCD screen. 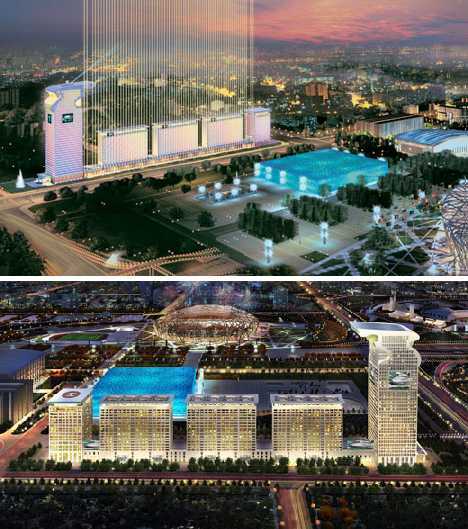 Most observers commenting on the Pangu Plaza assume it was built for the 2008 Olympics along with its more famous neighbors. Not so: it may share their general location in the designated Olympic Zone but much of the complex was incomplete as the Opening Ceremonies commanded the attention of billions worldwide. In addition, the tallest building has been likened to an Olympic torch crowned with a windblown, leaping flame. 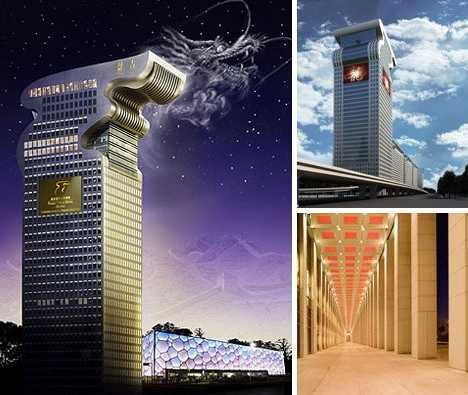 Not so: all 5 towers in the Pangu Plaza are linked lengthwise along their shared first three floors and the so-called “torch” topping the tallest tower is actually meant to represent a dragon’s head. 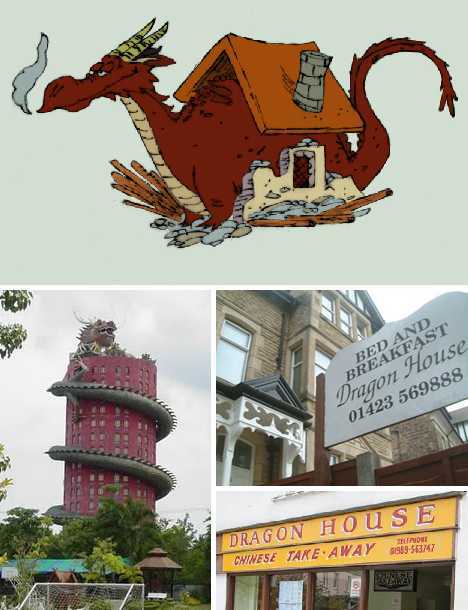 Thus put into context, one can discern the line of buildings forming a traditional Chinese dragon. The spaces between the buildings contribute to the overall visual impression of a dragon’s undulating body. Then again, pick up the entire complex and plunk it into downtown Omaha, Nebraska, and you could believe it was an architectural steam locomotive towing a quartet of boxcars. Though each of the 5 component buildings doesn’t really stand out quantitatively or esthetically, the whole of the complex is something greater than the just being sum of the parts. 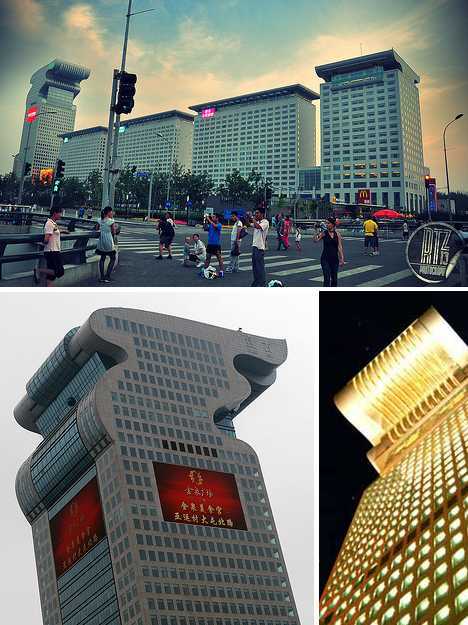 For one thing, some of the buildings have specific functions: the “tail” building is one of the world’s only two 7-star hotels while another building is a self-contained shopping mall. The remainder is comprised of office space, residential apartments priced in the millions of dollars, and secured parking garages. 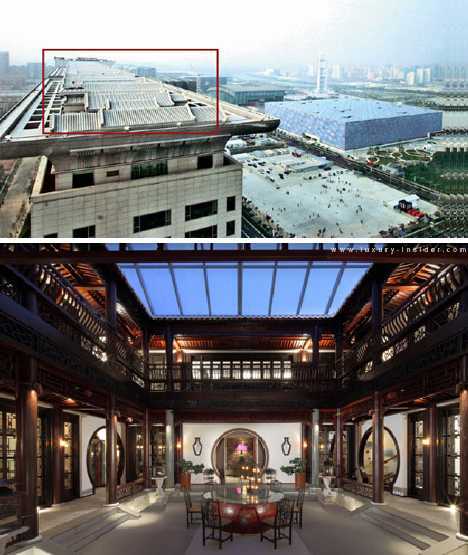 Even the tops of the buildings have been put to use as rooftop Chinese courtyards, equipped with sliding roofs that provide shelter during winter and/or inclement weather. Stats, you want stats? 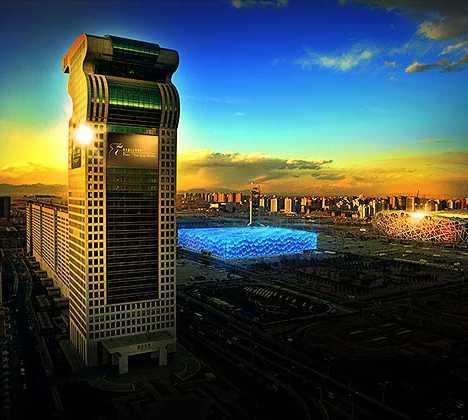 Here we go… from one end to the other, Pangu Plaza stretches the length of seven football fields. 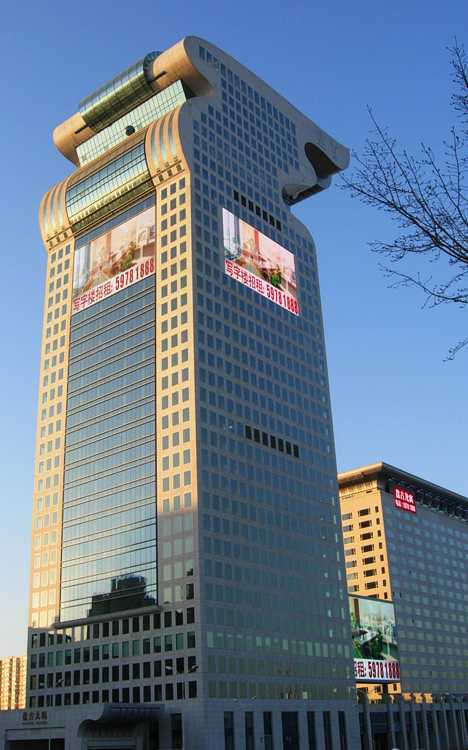 The four smaller buildings each stand 23-stories tall but the “dragon’s head” grabs the limelight. It’s 191.65 m (628.77 feet) in height, comprising 39 stories with 5 more stories extending below ground level. Visitors move through the building via 29 elevators and 6 escalators. 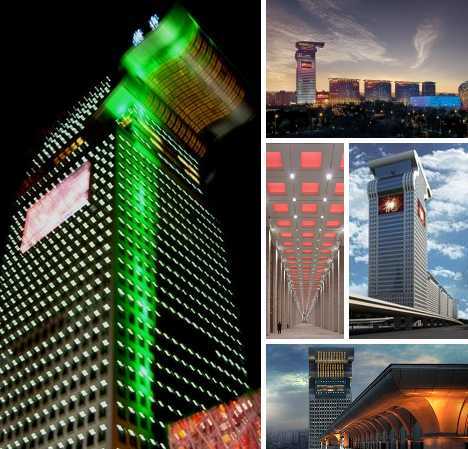 Embedded into the glass & white granite walls of the buildings are seven huge LED screens with a total area of 3400 square meters (36,600 sq ft). 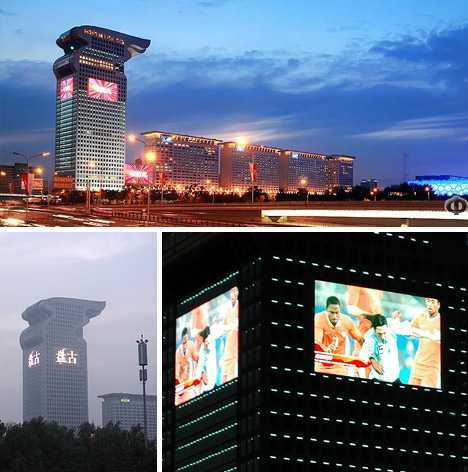 The largest, 900 square meter (9,688 sq ft) screen happens to be the biggest such screen in China. 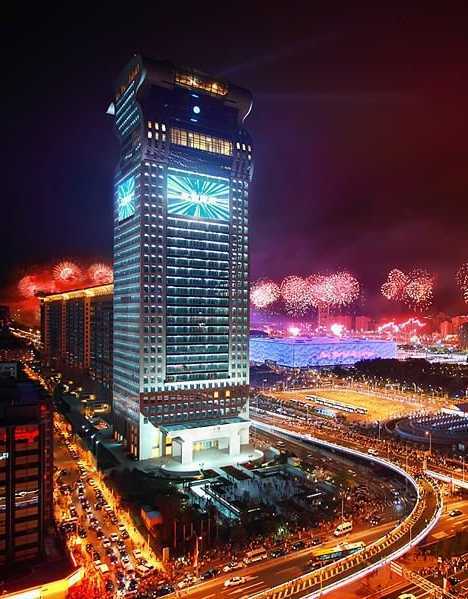 Pangu Plaza was designed by Li Zuyuan (above, right) of C.Y. 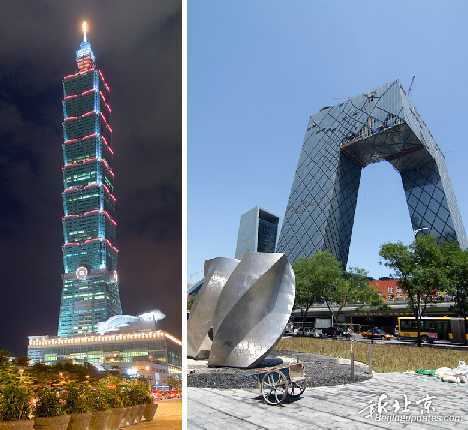 Lee & Partners, the Taiwan-based architecture firm responsible for Taipei 101 (above, left), the world’s tallest building until surpassed by Dubai’s Burj Khalifa. 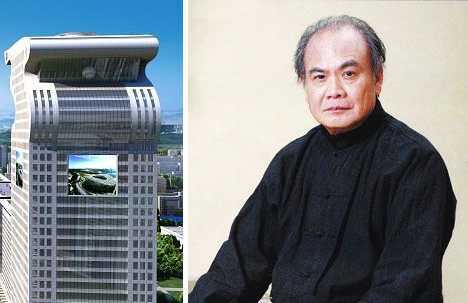 The fact that a Chinese architect was able to win such a significant contract is a hopeful sign for those who feel too much money has been “thrown at” foreign architects who turn a blind eye to Chinese architectural traditions. Indeed, more than a few of Beijing’s skyscrapers look sorely out of place… we’re looking at you, Rem Koolhaas-designed CCTV Headquarters Building (above, right), and it’s not easy. If the old adage of the candy store owner occasionally samples his own wares can be applied, then perhaps Liu Zhihua was seen once too often dining at Pangu Plaza’s $600 per person Japanese restaurant. Try the fugu, Liu. 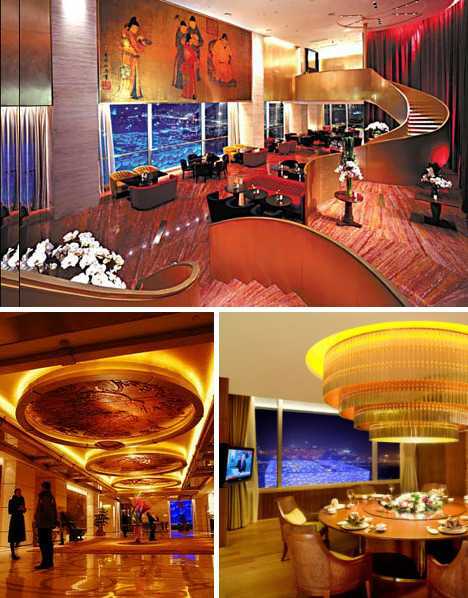 Other rumors concerning Pangu Plaza have made the rounds, most involving big names with even bigger bank accounts. “We have had a lot of very important guests,” stated Cai Xiaomin, a spokeswoman for Beijing Pangu Investment. 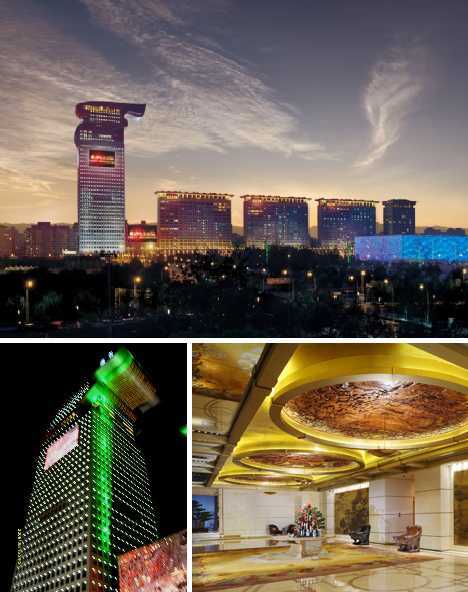 The Chinese developer doesn’t deny they want Pangu Plaza to be a preferred destination for “the elite of the world”, but company reps won’t comment whether Bill Gates paid $800,000 to rent a high-rise courtyard apartment for a year – one that sells outright for $17 million. They do, on the other hand, confirm that Warren Buffett made rental inquiries on one of the courtyard condos and that former American Secretary of State Henry Kissinger stayed in a luxury hotel suite during the Olympics. That’s about as elite as you can get, amiright?